Rural Devon is in the grip of a Thai cooking frenzy. 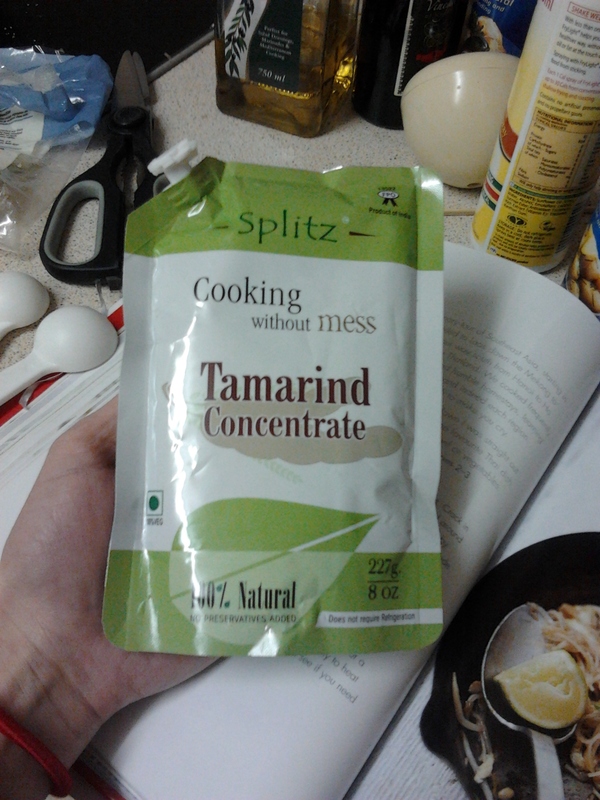 You might not think it, but that’s the only reason I can come up with for why my local Tesco has sold out (yes, sold out) of tamarind paste. But I finally tracked some down in a crazy healthfood store (the kind that sells 150 types of honey). Now I just have to think how to use up the rest. Perhaps I can sell it on the black market, to people equally disappointed by Tesco’s lack of stock. Otherwise, it’s Pad Thai once a week. This Pad Thai dish can all be made in one large frying pan or wok. It makes sense to do all your prep beforehand and put it in small containers ready to throw into the pan (e.g. de-seed and chop chillies). Apparently in America they tell you to wear gloves to chop chillies but in the UK we’re hard enough to do it with our bare hands. Just don’t rub your eyes. First toast the peanuts and crush them, then make this “thin omelette” thing in the pan. It really doesn’t matter if it falls apart or sticks, because you’re going to shred it anyway. 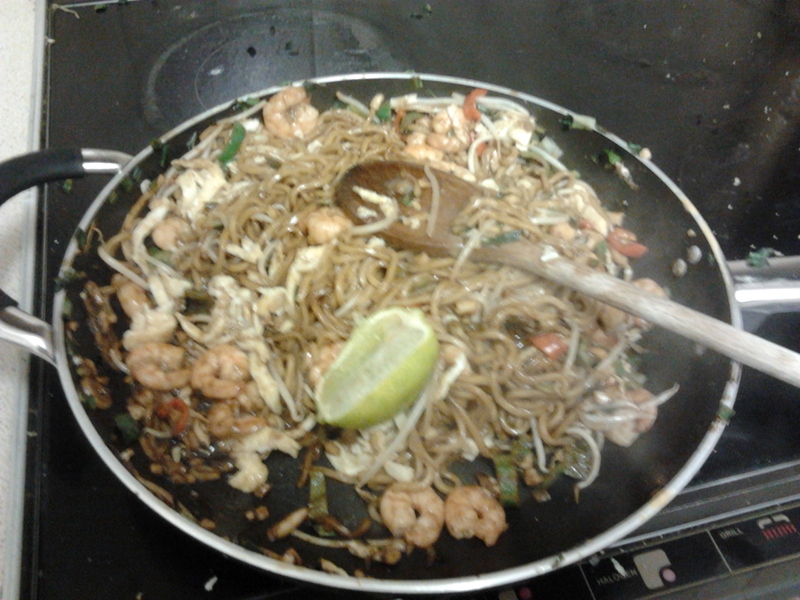 You first cook the spring onions and prawns. I was petrified of prawns, and now I’m only mildly terrified. They are pretty easy and quick to cook. You can always cut one in half to check it’s cooked (should be white inside). Then you add straight-to-wok egg noodles. The only egg noodles Tesco had were fresh (must be that Thai cooking craze again), but it didn’t really make any difference to the recipe. 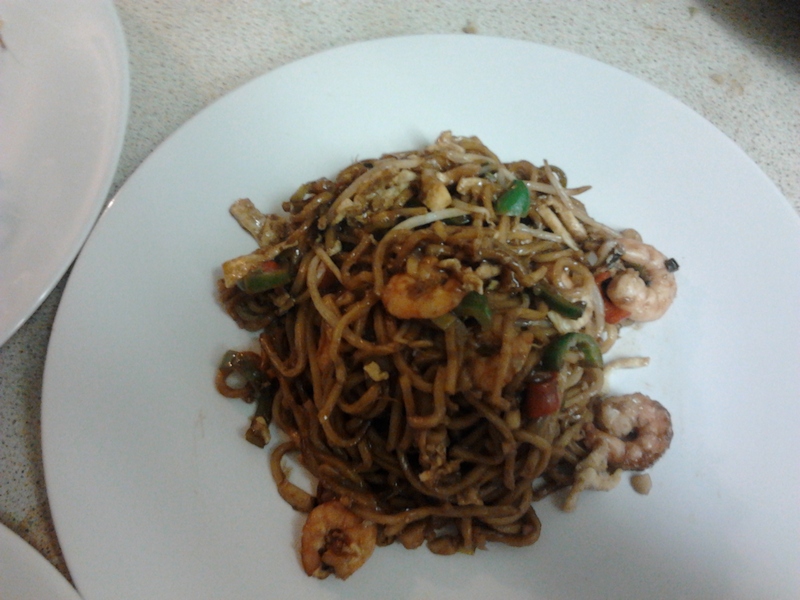 Add beansprouts, peanuts and seasoning including that elusive tamarind paste which gives the dish a sweet and sour tang. Mine was quite hot, in a good way, as I used 4 green chillies (remember contrary to appearances, the smaller, greener ones tend to be hotter). 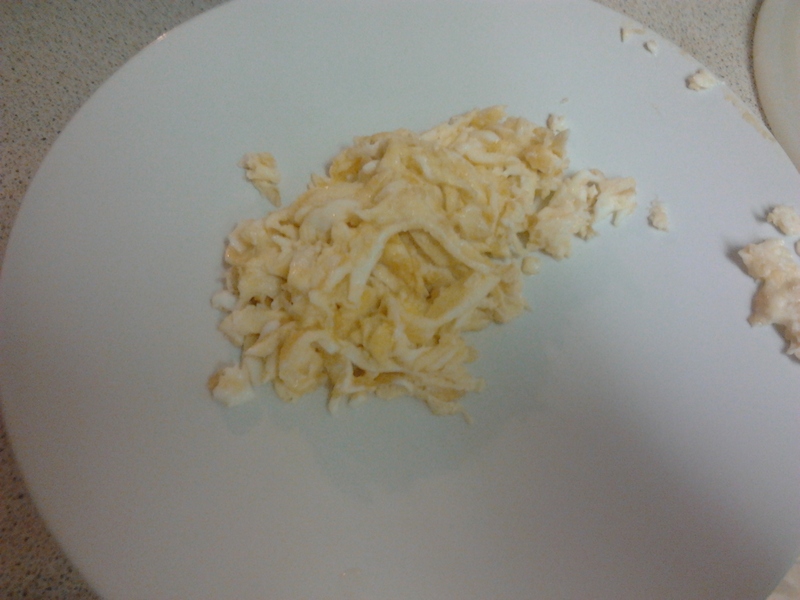 Then mix through the shredded omelette and lime juice and serve. but at least it looked ok on the plate. This was a very quick, tasty dish which I’m keen to try again. If you’re interested in cooking Pad Thai but want a slightly simpler recipe, bbcgoodfood has one here. This is my 25th recipe, which means I am a quarter of the way through my challenge! Go me!